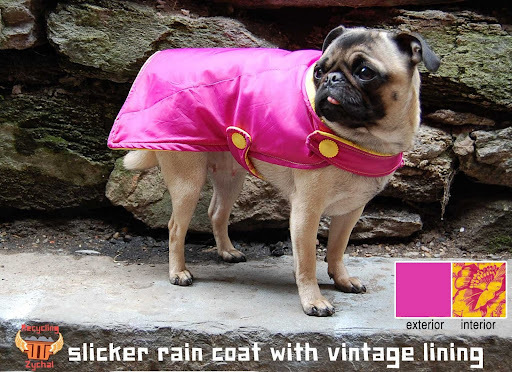 Petite Planet: Upcycle Broken Umbrellas into Rain Coats for Dogs! Upcycle Broken Umbrellas into Rain Coats for Dogs! I can't begin to count the number of umbrellas I went through when I experienced a record-breaking rainy and snowy winter in Manhattan. No matter how sturdy my trusty parasols appeared, the wind would blow them upward, snapping them and rendering them useless. Since April showers are now upon us, (and here in Portland we practically need to start building an Ark) I was thrilled to see this clever idea to upcycle broken umbrellas into rain coats for dogs! Recycling Zychal's shop on Etsy offers a wide range of weatherproof ponchos for your pooch in fun and funky patterns. In addition to accepting any and all broken umbrellas you'd like to send in for recycling, Recycling Zychal also donates $1 for each defunct umbrella received to the Morris Animal Refuge. If you have a large dog or a particularly tiny pal -- fear not, raincoats can be made in any size to fit any doggie!